Look, on one side you have your fantasy genre with wizards and dragons. On the opposite end you have sci fi space adventures full of bizarre aliens. Rarely do we get sorcery space adventures. 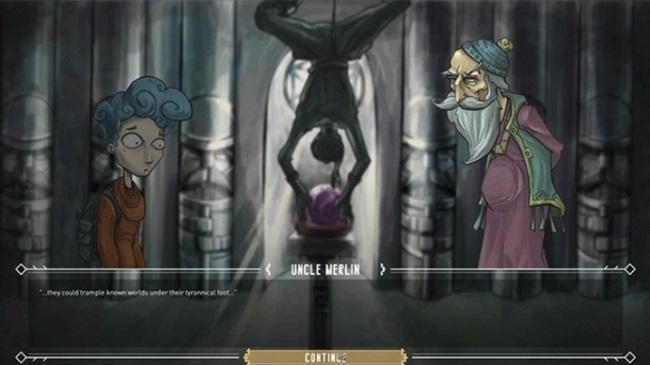 At least until Pocket Mana’s new Kickstarter project, My Uncle Merlin: a Tale of Wizards in Space. Seeking $22,000 in funding, the adventure game features a plucky protagonist named Edible “Eddie”. After a specifically tragic upbringing, Eddie joined his Uncle Merlin as an apprentice at the Royal Academy of Arcane Arts and Traffic Safety. One day a thief breaks into the Academy and steals a valuable purple pearl. Now Eddie and Merlin need to find the culprit and get back the pearl, also something weird is happening to the sun. Basically, the universe is in trouble and our unlikely hero and his lethargic Uncle are its best hope. Pocket Mana has already completed a fully functional first chapter of the story which serves as the Kickstarter demo. Gameplay consists of your typical adventure game problem solving with a few RPG elements sprinkled on top. While the demo is relatively short and leaves players with more questions than answers, it clearly shows off the potential of the project. Namely, a graphically distinct comedy adventure that is sure to please genre fans. During the journey Eddie encounters interesting and oftentimes bizarre characters who can either help or hurt his mission. Usually both depending on how the player chooses to interact with them. Even players with the best of intentions could find themselves undertaking dubious tasks as a means to a particular end. After all, running out of fuel in the middle of space will surely doom your whole crew. If someone occasionally gets fed to the ship’s dragon to keep the journey alive, well that’s just a sacrifice My Uncle Merlin expects you to make.